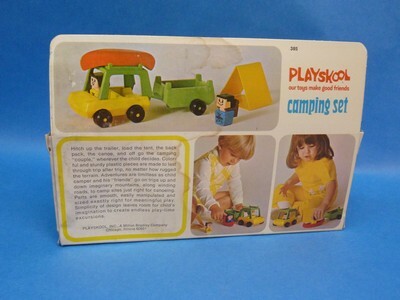 Description: This small set includes everything required for play-camping adventures. Car carries canoe on top, trailer hitches to car and carries a tent and backpack. 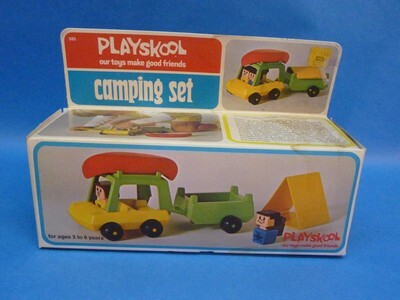 Also includes 2 camper figures. PSK89 - Car - Yellow squared car. The interior is square with a seat backrest divider in the center (can seat 4 figures). 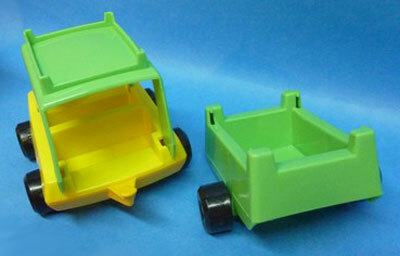 The car has a green top (attached to car via 4 corners around sitting area). The top may be removable? Rolls on 4 black wheels (marked Playskool) held on via yellow plastic rivets. 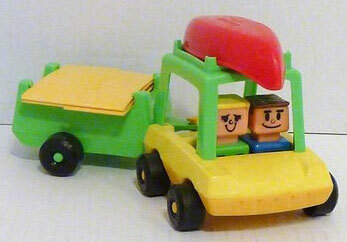 Has a peg on the back (to attach trailer). PSK90 - Trailer - Green square trailer with a recessed rectangular bed and 4 short raised support arms on the top corners (to hold boat and/or tent). Rolls on 2 black wheels (marked Playskool) held on via green plastic rivets. Has a hitch on the front (to attach to car). PSK91 - Canoe - Small red canoe with 4 support bars inside (holds 2 square figures in place within the boat. PSK92 - Tent - Yellow plastic tent with 3 panels. The tent can fold flat, or open to a triangle (end pieces latch together to form triangle). PSK93 - Backpack - Small brown plastic backpack with a squared "body", round towel roll at the top, and 2 stiff arms (clip on end of each arm) to attach the backpack to a square figure. Featured in 1974 JcPenny Christmas Wish Book (page 321) - price $3.88.